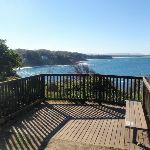 From the car park at the Bush St Reserve, Norah Head (near the intersection with Young St), this walk goes past the toilet block and across the park to the information board and trackhead at the back corner of the park. 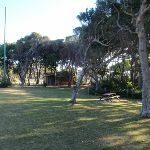 This picnic area is in Bush St, Norah Head, near the intersection with Young St. 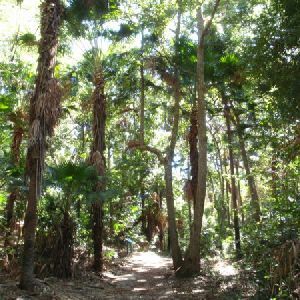 The reserve has parking, toilets, picnic tables and garbage bins. 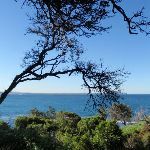 There are fantastic views along the coastline. 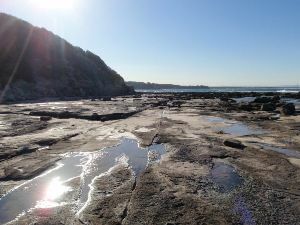 The Headland Nature Trail starts here, and it also a short walk to the beach and ocean rockpool. 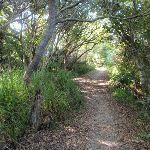 Veer right: From the trackhead at the back of Bush St Reserve, this walk goes through the timber barricade, passing the ‘Headland Nature Trail’ sign and following the bush track. 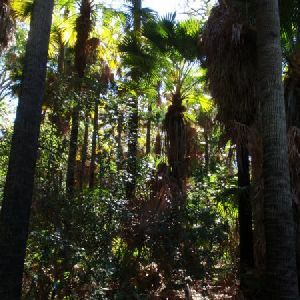 The track winds through the beautiful area of bush for a while before reaching an intersection with another bush track, close to a fenced lookout platform. 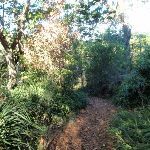 Veer left: From the intersection, this walk goes a very short distance along the bush track to the fenced lookout platform. 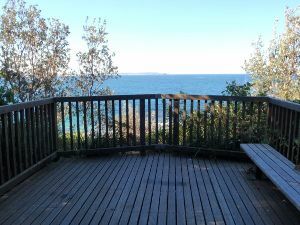 This unnamed lookout is on the Headland Nature Trail at Norah Head and has excellent views along the coastline and out to sea. 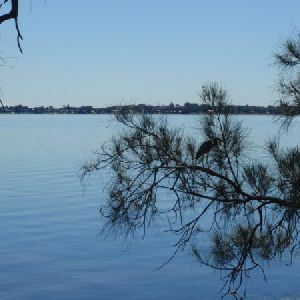 The lookout is on a small, fenced, wooden platform. 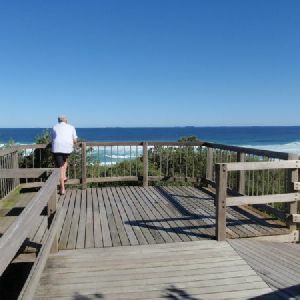 Turn around: From the lookout platform, this walk goes a very short distance along the bush track to a ‘Y’ intersection. 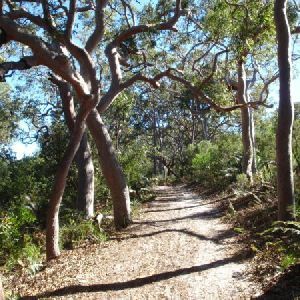 Veer left: From the intersection, this walk follows the bush track, taking the left fork, directly away from the nearby lookout platform. 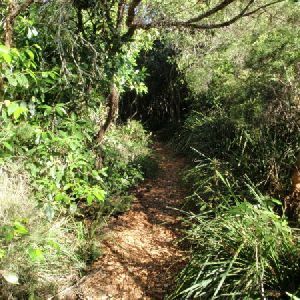 After a short distance, the track follows a ‘Nature Trail’ arrow to the left, ignoring a track to the right, and continues meandering through the bush. 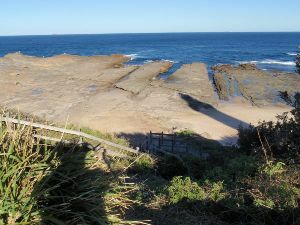 The track passes over a small timber bridge and bends to the right, continuing through the bush for some time and arriving at the end of the lighthouse car park. Continue straight: From the end of the car park, this walk crosses the car park, tending to the left, then crosses Bush St to the Merchant Mariners memorial and lookout. 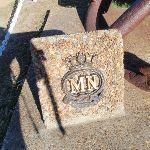 There are numerous plaques in the footpath and set in rocks at the memorial, providing information about merchant ships and lives lost during times of war. 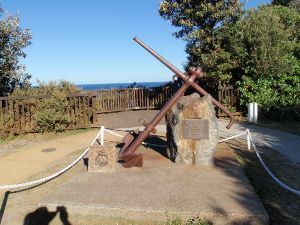 Turn sharp left: From the lookout, this walk follows the footpath towards the lighthouse, passing an information board, to the right, and keeping the driveway to the left. The walk soon arrives at the corner of the lighthouse cottage yard, beside the car park. 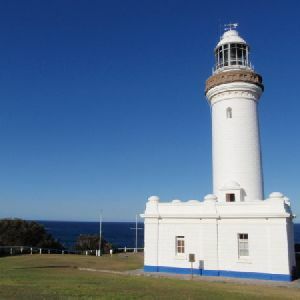 The cottages at the Norah Head Lighthouse can be booked as accommodation (ph: 1300 132 975) and the Lighthouse grounds can be booked for weddings (ph: (02) 4396 4102). More info. 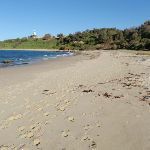 Continue straight: From the corner of the cottage yard, this walk follows the footpath past the lighthouse cottages, to the left, to the gate beside the lighthouse. 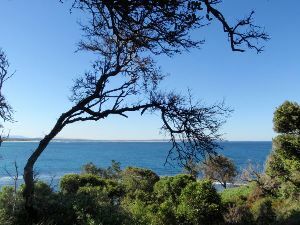 Continue straight: From the gate beside the lighthouse, this walk follows the footpath, gently down the hill, towards the ocean. 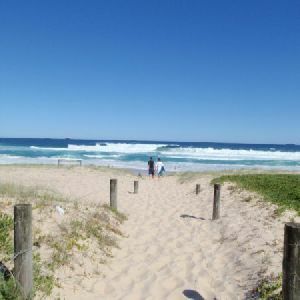 The walk soon reaches a viewing point at the top of the beach access steps. 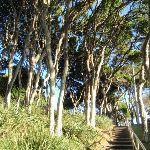 Turn right: From the top of the steps, this walk goes down the timber steps to the beach at the bottom. 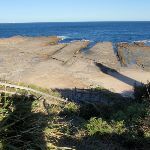 Veer left: From the bottom of the steps, this walk crosses the end of the sandy beach and explores the extensive rock platform before heading north around the headland, keeping the ocean to the right. 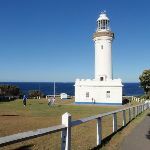 Soon after going around the headland, the walk reaches the southern end of Lighthouse Beach. 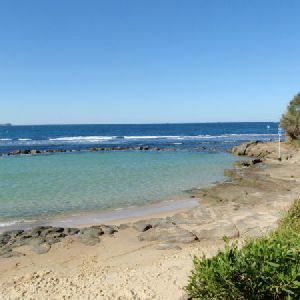 Continue straight: From the southern end of Lighthouse Beach, this walk follows the beach north, keeping the ocean to the right, until reaching the rock platforms at the north end of the beach. 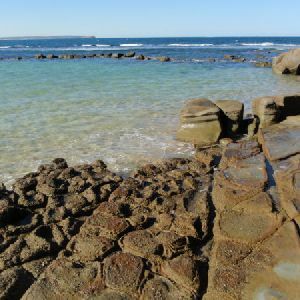 Continue straight: From the northern end of Lighthouse Beach, this walk goes north across the rock shelf, keeping the ocean to the right. 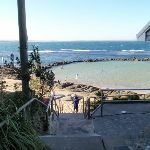 The walk then goes up the steps and along the concrete footpath with the metal handrail, around the headland and past the ocean pool, to the right, before arriving at the bottom of the concrete steps, just below the toilet block. 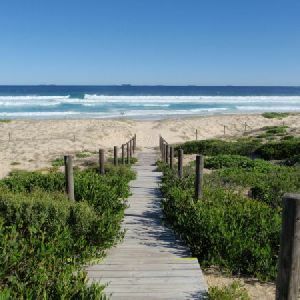 Turn left: From the bottom of the steps, this walk goes up the concrete steps and footpath, away from the ocean pool, passing the toilet block, to the left. 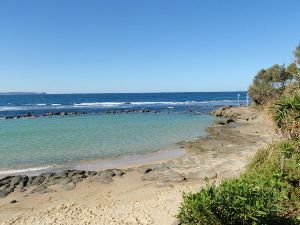 The walk continues up the footpath, with houses to the right, until an intersection with a sandy path, to the left, signposted ‘Cabbage Tree Harbour Rock Pool path, Bush St’. 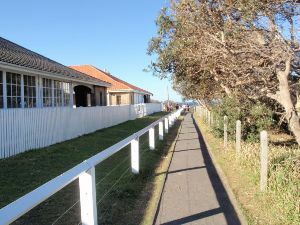 Turn left: From the intersection, this walk follows the sandy track away from the houses and the concrete footpath. 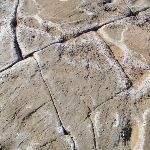 The walk bends to the left and soon reaches an open grassy area. Here, the walk bends to the right and continues across the grassy area, keeping the car park to the right, and passing some picnic tables, until reaching the information board and trackhead at the back of the park. 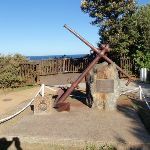 Turn right: From the information board and trackhead, this walk goes across the park, past the toilet block, to the car park of the Bush St Reserve, Norah Head (near the intersection with Young St). 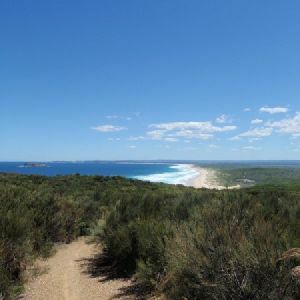 1.8km of this walk has gentle hills with occasional steps and another 380m is flat with no steps. The remaining (290m) has short steep hills. 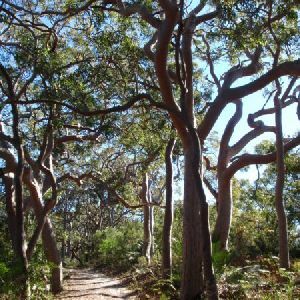 1.1km of this walk follows a rough track, where fallen trees and other obstacles are likely and another 600m follows a formed track, with some branches and other obstacles. 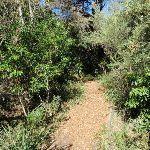 Whilst another 380m follows a smooth and hardened path and the remaining 370m follows a clear and well formed track or trail. 1.1km of this walk has minimal directional signs and another 720m is clearly signposted. The remaining (630m) has directional signs at most intersection. 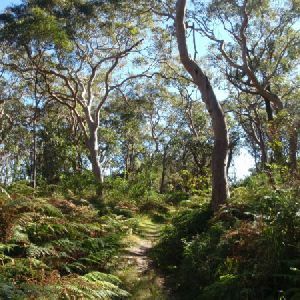 Around 1.2km of this walk requires some bushwalking experience, whilst the remaining 1.2km requires no previous bushwalking experience. 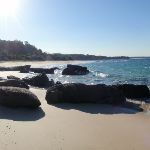 Around 2km of this walk is not usually affected by severe weather events (that would unexpectedly impact safety and navigation), whilst the remaining 450m is affected by storms that may impact your navigation and safety. 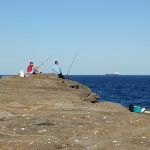 1.3km of this walk is close to useful facilities (such as fenced cliffs and seats) and another 840m has limited facilities (such as not all cliffs fenced). 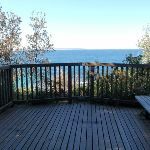 The remaining (360m) has limited facilities (such as cliffs not fenced, significant creeks not bridged). 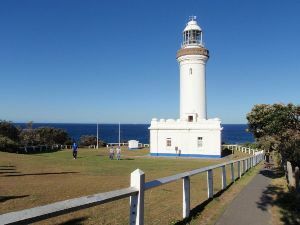 A list of walks that share part of the track with the Norah Head Lighthouse Loop walk. 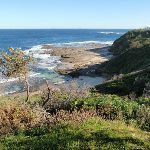 A list of walks that start near the Norah Head Lighthouse Loop walk. 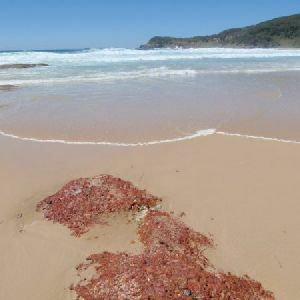 http://new.wildwalks.com/wildwalks_custom/includes/walk_fire_danger.php?walkid=nsw-norahheadlightr-nhll Each park may have its own fire ban, this rating is only valid for today and is based on information from the RFS Please check the RFS Website for more information.